Behind the Bit: Converting a horse's age to "people years"
Converting a horse's age to "people years"
Harvey is 71 in human years! HAPPY BIRTHDAY TO THE HARVSTER!!!! Harvey turns 21 on Wednesday, March 5! 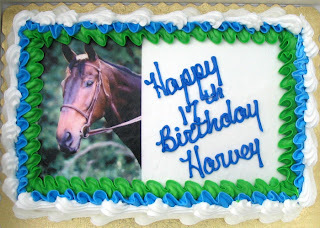 Harv's birtdays merit a barn-wide celebration, and I take carrot cake for the boarders and carrots for the horses. For his 21st, there will be wine too. This is a photo from last year's birthday, Harv and I are second from the left. 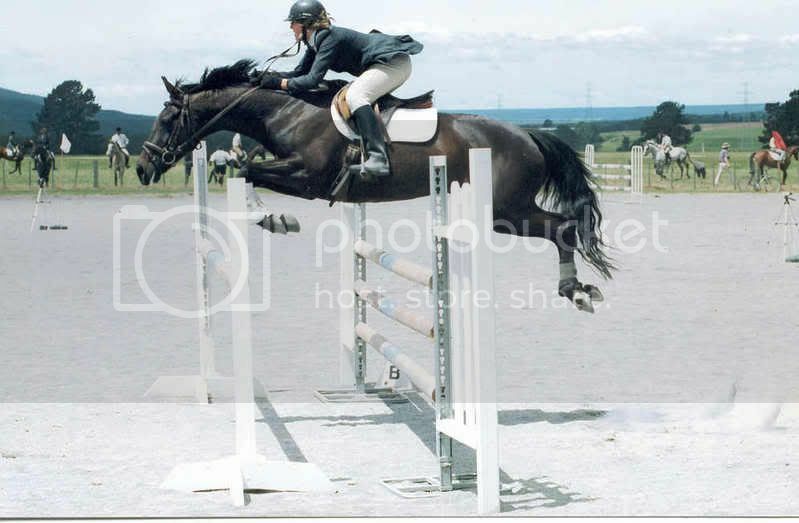 Three other horses turned 20 in March so we went together to celebrate. In addition to food and a photo retrospective on each horse, the 20 year olds got a neck ribbon of their own. Don't they look great? It was a lovely day. Cited source: S.E. Blackwell. 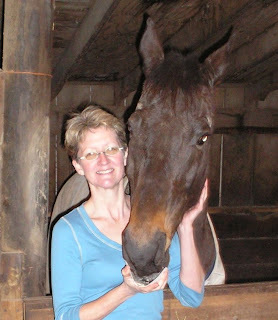 The Senior Horse - More Than Just Basic Care In: NAVC Proceedings 2007, North American Veterinary Conference (Eds). N. Fort Myers, FL, USA. Happy Birthday Harvey! So cool, that cake! I've done the age calculation for my eldest cat, Stinky. She's 77 in human years and would eligible for a lot of senior benefits by now. She does get a lot of special treatment from us, since she isn't very perky these days. We bring her breakfast in bed and help her up on windowsills, where the little staircase we bought her won't reach. She's a little arthritic too, in her hind legs. We do what we can to help the 'ol girl out! p.s. Now I want some carrot cake. All you had to do was mention it. Thanks for the info! That means Reno is 78.5 now--and he was bucking across the snow this morning and then cantering up to me to get his morning grain. The vitamins must be working--check him out on my blog heading! Harv looks great, we had carrot cake last night, so we'll honor him tonight when we eat it again! That is a cool idea to have celebratory ribbons. My 40 year old horse died recently, and I am consoling myself with this age calculator. If my math is right, she would have been 118.5! !